I will just kick the reporting off briefly here, hoping some others are able to follow-on and elaborate? I have no photos or like to share of Leonard or the concert itself and it is quite unlikely anyone will have, as this venue's staff were strictly policing a "no photographic or other recording" policy! Anyway, believe me, Leonard's concert was as magnificent as the building (which is only 7 years older than our man). The 27 songs performed (as posted in set list section) were executed by him and the whole band with the verve, class and highly honed skill levels we are all accustomed to by now, so I won't do an analysis in this respect. In terms of his usual early concert humorous "rapport establishing" comments, this time he acknowledged not only the endangering of the family budget (for the front rows), but also warned those of us up in the "high places" (dress circle heights) not to "lean enthusiastically"! However, although the 'Tower of Song' spiel was a slightly more interesting variation on the ones I had seen before, what was truly unique about this concert were two sets of comments by Leonard in particular: firstly, he flattered us as a nation by saying Australia seemed to be in the "centre of things" these days (though I'm not quite sure how he figured that out) and how we were an "exemplary country"; secondly, he shared with us a bit later that he'd had a medical emergency after arriving here, which our medicos needed to deal with urgently, praising them accordingly for their friendliness, competence etc. and indicating that some were in the audience tonight! So, another unforgettable night was had by all ... and it was hard to leave the place, really. 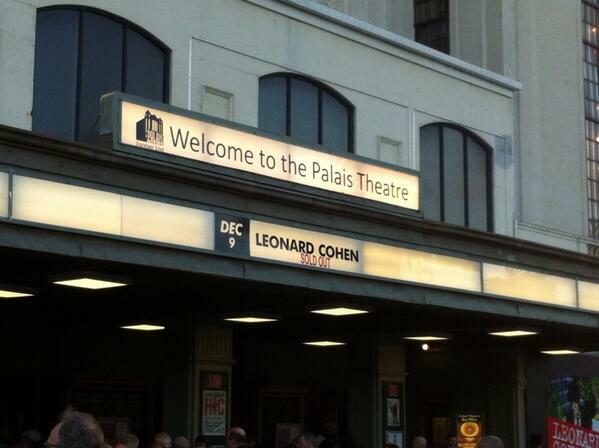 @PalaisTheatre - TONIGHT *LEONARD COHEN* Sold Out. 7:30 Doors-8 Act 1-9:20 Interval-9:40 Act 2-11:15 End* approx. @KorenHarvey - Leonard Cohen, you do it to me every single time. Pure class. @michelhogan - #LeonardCohen show last night at @Palaistheatre was fabulous from top to bottom. TONIGHT *LEONARD COHEN* Sold Out. 7:30pm - Venue Opens || 8:00pm - Act 1 || 9:20pm - Interval || 9:40pm -Act 2 || 11:15pm - The End* all times subject to change by the artist. No support, Leonard Cohen plays the entire show. Last edited by sturgess66 on Wed Dec 11, 2013 4:29 am, edited 1 time in total. While I have been a huge fan of Mr Cohen for many many years, this was my first concert by him and I'm afraid I was quite disappointed in the sound system. While the concert would have been excellent, not being able to hear the words was very very disappointing. The reason I am writing this is because I have been thinking about the concert and need to say something, sorry.